While I may come across as a heartless ogre (admittedly, my trollish face doesn’t do much to convince them otherwise) there are a few simple reasons I insist on opening with writing prompts. PUTS PEN TO PAPER: We get busy. Insisting on a daily writing prompt ensures that my students (and I) put pen to paper and write, even if only for a few minutes each day. We can only improve our craft if we’re actively practicing it. 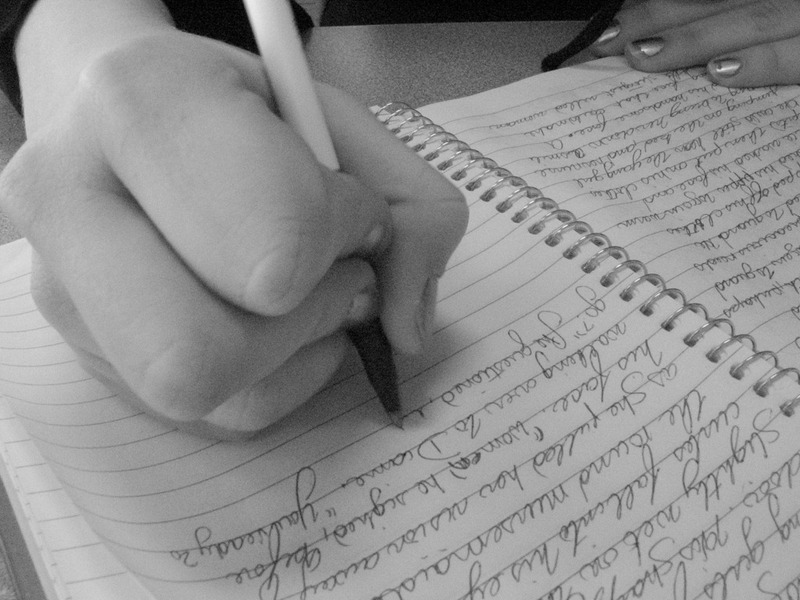 Ten minutes of daily writing will do more to improve our craft than the occasional, once-a-week writing marathon. Consistency helps us develop good habits—that is, the daily practice of our craft. ENCOURAGES THINKING CREATIVELY: Even if you don’t like the prompt, writing it may spark something in your imagination that will launch the plans for an entire story, novel, world, or even planet-eating death star. Often, it is not the prompt itself that results in the formation of a novel, but the spark that prompt encourages. THE HARDER IT IS, THE BETTER IT IS: Another complaint I get is this: “Do I have to do it that way?" Yes. Yes you do. But thanks for asking. Why? The harder it is, the better it is for your development. Working within a structured set of rules will force you to be more creative within those boundaries. We throw the term “rules” around when discussing craft, and as soon as the word leaves our lips, someone stands up and shouts, “Nonsense! Writing has no rules! It’s all subjective!” When they do, I hear the their true cry: “It’s too hard! I don’t want to do it!” There are rules for good writing. It is not subjective. And, as in poetry, the breaking of those rules can be a powerful, strategic literary move. But only if it’s strategic. If you don’t know the rules, you can’t break them. Working within boundaries makes us stronger. Think of it as a work out. You may lift weights, but doing bicep curls doesn’t do much for your calves. Writing prompts are like structured work-outs to help a specific aspect of your writing. When you do enough of them, the whole body benefits. RESOURCES FOR WRITING PROMPTS: Here are a few links if you’re thirsty for some prompts. Go, therefore, and create. I enjoy the “do now” prompts. I like taking the prompt and making something that wasn’t planned happen at the end. A nice little twist for me and the reader. But I do not like reading in class. I feel as if only a few people have the guts to put their story out there for people to hear, and I am tired of my own voice. I think that the prompt and lack of confidence attributed to why sixth period doesn’t want to write or share their stories. If a few students just took the leap and read they might start to enjoy the prompts a little more each day. I like the some of the prompts. I like that out of those prompts we can write a story with out planning on it. I like everything in creative writing expect that we have to read out aloud that kind of makes me nerves. Sounds like you guys aren’t fond of reading in class. Think of it this way: What’s the worst that’s going to happen? No one’s going to laugh at you. No one’s going to think you’re stupid. If they don’t like your story, that’s their problem. You took that prompt and gave it a flavor only you can do. That’s your writing style. Besides, you can’t lose points for reading. If you’re really scared, then don’t read to the class. Read to something across the room. Depending on where you sit, read to a poster, or the clock, or even the white board. Inanimate objects can’t judge your writing, so it’s like you’re reading it out loud to yourself. Even if some fool has the audacity to insult you or your writing, take it in stride. If they were trying to critique you, then consider their critique to help make your writing better— I think you’ll find it more helpful than harmful. And if they’re just being a jerk, then they are obviously rather stupid and their words don’t mean anything. Calm down. Focus. Have fun in the class, and don’t be afraid to get out there and read. The only villain that can stop you is yourself. Are you afraid of yourself? Of course not. (If you are, then I recommend getting some serious help.) Show the class the kind of writer you are, for the pen or pencil in your hand is your greatest weapon. Don’t think of rules as limitations. Rather, think of them as new toys to play with in the fictional world of the imagination. Now, swallow that nervous feeling and get out there! When we have a do now at the beginning of the class period I like most of the prompts, but some of them I don’t like because you really have to think about what you really want to write about. I love writing but the one thing i don’t like is to read what I wrote out loud in front of the class. Maybe if more people like the prompts that you put up maybe they will start to read more even if they are scared of the class looking at them or even making fun of them because of what they wrote. Hopefully soon more people will read their prompts and they will enjoy the class more and enjoying reading in front of the class. Wow Gansky way to single out half of the class. We do complain because not all us are that of writers. Yes we signed up for the class. Not all of us were shooting to write novels or short stories. We do what you say and we roll with it. Even if we don”t do it in class we go home and better it. Some of the prompts are weird, but some are cool though. I pictures are the best because everyone puts their own unique twist on them. I wish we could more poetry cause that’s right up my alley. To be honest I like the prompts. They get my creative juices flowing, I love the ones about snow, I hooded do like a valentines prompt. I generally like the Do Now prompts. Obviously some of them are hard for some of us but they tend to actually get me thinking. Ha, I tend to not read because I usually dislike everything I write until I look back later and reread it. I enjoy writing the prompts. I like how creative your prompts are. I also like how we have the choice to read them. It would be horrible if you randomly called on me when I wrote a horrible story. I’m not a good writer although I do enjoy writing. What! Did you people not read the blog. These PROMPTS are not ment for mere humans, this PROMPTS are ment for writers. No I take that back there ment for true writers. How could someone expect to get better at anything if they dont practice. Thats all the PROMPTS are their not demons trying to engulf, PROMPTS are your freinds like your daily vitamins to help build a stronger body for you. You can consider these PROMPTS your perscription…if you want to. ehh.. well i dont really always agree to your prompts,true. but I try my best to make something up and write. but the stories usually turn out the same for me. like, it seems no matter the prompt, the story or plotline turns out the same in a way. I feel like im doing the same thing over and over. occasionally I will be proud of myself for comming up with something amazing, but other times its just like,”I wrote something similar to this before.” and if I try to do the prompts differently I dont like the results. so im stuck. Whoopee! I think that some prompts are really inspiring. they can really lead to a very powerful story. some just are just boring that it makes it hard to come up with a good stories. i say you should put better prompts up. i like your class and i like your most of your prompts. Like for exapmle the one about being stranded in the gas sation. I never really hear complaints, I thought that everyone in the class was too busy talking to actually do the DO NOW. Humor aside, the prompts really do make us better writers because they get us to think or approach a story in a new way, expanding our arsenal of writing weapons. My personal favorite DO NOW activity is the first line one because it gives us many options to continue a story. The morning “Do Now” prompts can be really enjoyable. There are a lot of outrageous prompts to write for that help stretch the imagination. Although I don’t want to be a famous writer when I get older, I do appreciate the prompts given. They helped me with details and settings a lot! I am one of the kids to hide in the corner instead of read out loud, but I think that’s because I have always taken writing serious and never really felt like I wrote well enough. I think doing more prompts will help me do better and feel more comfortable with my writing.